Once the hostess has decided to entertain a few guests, she should bear in mind that not only is the menu important, but also the decoration of the table. Daintily folded napkins lend enchantment to the atmosphere; they tell the story of a caring hostess. Napkins need not only be used for celebrating with smartness or stateliness; they everyday family meal can be transformed into a festive treat merely by ingenious use of napkins. Servetvoukuns/Napkin Folding introduces the hostess to 101 different ways of folding napkins, with clear step by step illustrations and colour photos. 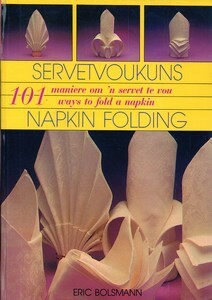 Servetvoukuns/Napkin Folding (the text is in English and Afrikaans) was first published by J. P. van der Walt en Seun in?Pretoria as a 110-page hard-cover edition in 1987. The third edition appeared in 1994.